Description of "Single Rule for Success"
When things are not going right in your life and no advice is working, you need some magic potion. Presenting a set of cheat codes, shortcuts, and secret recipe to prepare you for success. People say, there is no single rule for success...I challenge them! There is a single rule for success and that has been practised by all successful people, try it out yourself and write down your own success story! If one were to ask my friends to describe me they would describe me as a very positive, jolly, active and intelligent person. I am a person with technical aptitude, analytical and problem-solving skills and knowledge in management too. Growing up in a generation that is primarily known for its technological advancements, I was always amazed to see how technology gradually evolved; filling the gaps in all dimensions of human’s life. This curiosity and interest in technology ignited my pursuit of the bachelor’s degree in engineering, where I was exposed to various segments of engineering technology and management fundamentals. I enjoyed organizing technical & cultural fests. Business background of my family has helped me in developing an entrepreneurial way of thinking. I have handled many leadership roles from my school life itself and have always been a great team player. House Captain in school, Organizer during B.Tech. course and handled multiple roles during my MBA course such as – President of Management Student Association, Founder of two small projects and Organizer of several events. 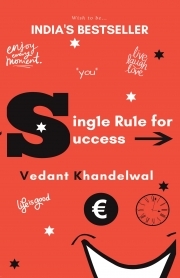 Reviews of "Single Rule for Success"
It's an amazing and easy to understand book for all the youngsters who want to succeed in their life and make best possible use of the opportunities they get to achieve their goals! Nicely put up examples and stories help to connect what the author wants to convey. good luck!